Today’s Koala Class was a lot of fun! We were able to do a lot and the children seemed to enjoy themselves. 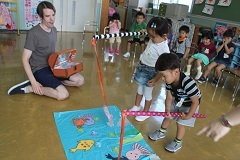 The children continued learning about sea animals and were able to go fishing in our activity. The children really impressed me by remembering words like “fish”, “octopus”, and “crab”. 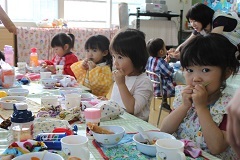 After fishing, dancing, and doing phonics in our lesson we had udon for lunch. At the end of the day the Koala Class children’s parents came and we practiced the Sports Festival dance together. The children tried dancing with pom-poms for the first time and we had a good time. We look forward to class on Friday and practicing the dance even more!